One of the most common and most aggressive types of primary brain tumours is called Glioblastoma multiforme (GBM). Even with a combination of powerful treatments such as surgery, radiotherapy and chemotherapy, the survival after diagnosis is expected to only be approximately 12-14 months. With the support of Action Against Cancer, Professor Georgios Giamas’ team at the University of Sussex have been exploring the role of the cancer causing gene LMTK3 in the progression and development of GBM. Their ultimate aim is to develop a new drug to overcome this crucial gene. It has been shown that when a specific part of chromosome 19 in humans is lost, GBM patients respond better to radiation and chemotherapy. The team discovered that LMTK3 is amongst the approximately 30 genes that are located at this small section of chromosome 19. Bioinformatics is an increasingly commonly used method applying computer software to interpret biological data. Such an analysis revealed a significant overexpression of LMTK3 in different parts of the brain compared to other tissues in the human body, suggesting that LMTK3 has a specific role in the brain. To date, the team have been using seven different GBM cell lines in the laboratory. After examining the expression levels of LMTK3, they observed variations in the protein levels in different cells. They will now examine whether these changes may be linked to the ability of different cells to multiply or migrate more (as they have previously observed in breast cancer cell lines). In addition, as shown in the image right, they analysed the localisation of LMTK3 in these GBM cell lines. 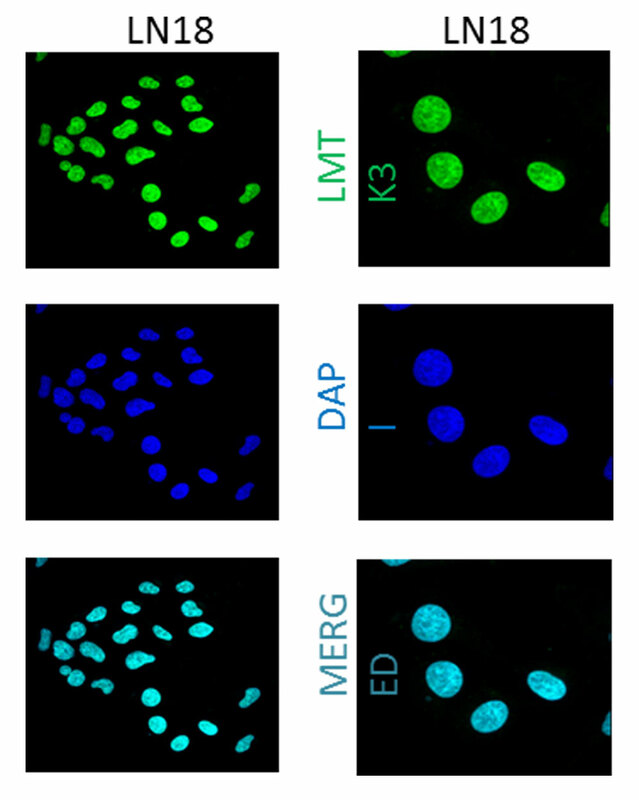 The preliminary results demonstrate a predominant localisation of LMTK3 inside the nucleus instead of other parts. They will now investigate the significance of this result by performing different cellular and molecular experiments. Perhaps the most exciting results so far relate to the work examining the contribution of LMTK3 in Temozolomide (TMZ) resistance in GBM. TMZ is the main chemotherapeutic drug used for the treatment of patients with GBM. However, after some time, patients become resistant to this drug and eventually die. Understanding the mechanisms of resistance to TMZ could lead to improvements in the efficacy of this drug and increase the survival of GBM patients. In their experiments, the team observed that after temporary inhibition of LMTK3 expression, certain GBM cell lines started to die in the presence of TMZ. This result suggests that LMTK3 may indeed be involved in the mechanisms linked to TMZ resistance. Genomic analyses to identify potential ‘signatures’ of proteins and genes that are expressed in GBM patients compared to ‘normal’ brain tissue. Such information can serve as biomarkers for predicting the possibilities of someone developing this type of tumour. A study on the expression levels of LMTK3 and its overall contribution in the survival of GBM patients. The generation of specific GBM cell lines that express either very high or very low levels of LMTK3 to further explore and clarify the contribution of LMTK3 in the development and progression of GBM.